Members of the Chinese National Paralympic Committee, NPC, visited Brisbane last week and took the time to meet with Sport Inclusion Australia and Global Games Sports Company, CEO Ms. Robyn Smith and General Manager of the Global Games Sports Company, Mr. Greg Dunk. The Chinese delegation included Vice President NPC China Mr. Jia Yong, Deputy Secretary General NPC China Mr. Zhijun Yong and Chief Officer for Foreign Affairs, Ms. Wang Bo. 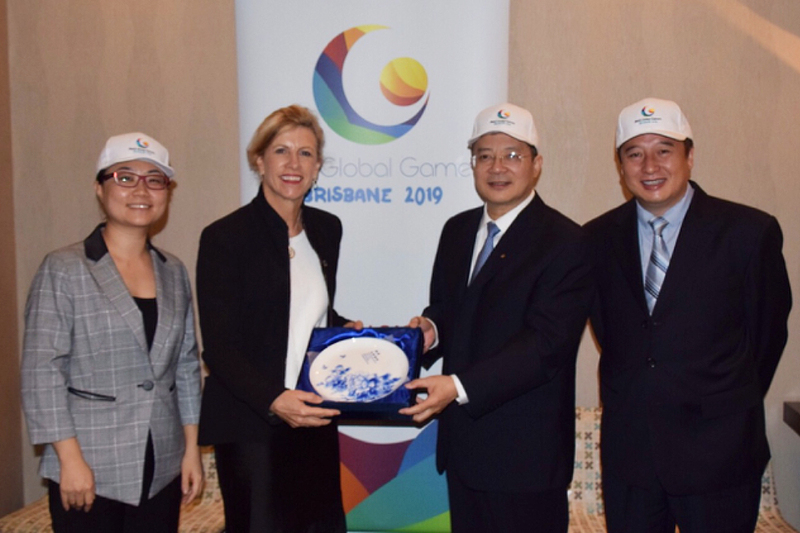 The meeting provided an opportunity to discuss the development of opportunities for athletes with an intellectual impairment both within China and Internationally and China’s potential to participate at the 2019 Global Games in Brisbane. Ms. Smith has been working with China through the Department of Foreign Affairs and Trade through the Asian Sport Partnership program to develop opportunities for athletes with an intellectual impairment. As Vice President of the International Federation for athletes with an intellectual impairment (INAS), Ms. Smith has also been working to assist China with the eligibility process which when completed will open the door for athletes from within China to participate on the International stage at INAS and Paralympic events. The meeting enabled Ms. Smith to demonstrate the work that had been completed to date with the eligibility process and show a promotional video for the Global Games which had been translated into Chinese. “The opportunity to meet with the Chinese National Paralympic Committee delegation face to face is so important, it provided an opportunity to demonstrate the work that we have been doing and to obtain feedback directly from the delegates. Establishing personal relationships is also extremely important as we move forward.” Ms. Smith said. The delegation were impressed with the presentation, our commitment to people with an intellectual impairment and in particular our efforts to be inclusive of Chinese people. The delegation also confirmed they have a large number of athletes with an intellectual impairment participating in sport many of whom will be ready to compete in the INAS pathway once the eligibility process has been developed in China. China do not have any athletes currently registered with INAS and consequently had no athletes with an intellectual impairment compete at the 2016 RIO Paralympics, where China dominated the medal tally with a staggering 239 medals. They now have their sights firmly on the additional 54 medals in the intellectual impairment area. “Having the Chinese delegation in Brisbane and having the opportunity to discuss INAS, INAS eligibility, Classification, Oceania/Asia relations, 2019 Global Games and Australia/China relationship with him and obtain his commitment to our movement was so invaluable.” Ms. Smith said.